Learn the Segment Addition Postulate in a SNAP - literally. The phrase "Segment Addition Postulate" can be a little intimidating, especially at the beginning of a Geometry or Honors Geometry course. However, we will show you that this postulate is nothing more than breaking sticks...and then putting them back together. You can do that right? Okay, good. So let's simplify this "intimidating" topic. Next, measure the length of your object. Our skewer is 8 inches long. Break the object into 2 pieces and measure the length of both pieces. Our pieces are 2 inches, and 6 inches long. Finally, put the two pieces back together. Measure the length of the skewer or stick now that it is put back together. Our skewer is still 8 inches like it was originally. Does this seem easy and obvious? Good, it should! Congratulations, you just modeled the postulate. Now, to get a little more technical. 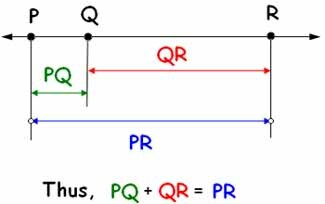 The math definition of a postulate says that if point Q is between points P and R on a line, then PQ + QR = PR. Take a look at the diagram below. All this means is...if you take one piece of a segment (PQ), and add it to another piece of a segment (QR), you get the entire segment (PR). "The sum of the parts equals the whole." Return from Segment Addition Postulate to Free Geometry Help.